Every year, Tilden Law prepares, files and achieves dozens of criminal record expungements and sealings in Florida on behalf of our clients. Our expungement/sealing process begins by determining whether our client qualifies by statute to take advantage of the criminal record expungement process. 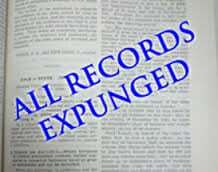 Florida Expungement/Sealing Statute 943 addresses both the process and requirements the applicant must meet prior to petitioning the court. Can I Expunge or Seal more than One criminal record? As the law stands currently, Section 943, Florida Statutes allows for a single act or occurrence to be sealed or expunged in the applicant’s lifetime. What does this mean? If the petitioner has more than one crime that occurred on more than one date, the applicant must chose only one event or crime to be expunged or sealed. If, however, the applicant has more than one criminal offense that happened out of one event on the same date, the entire sequence of charges are eligible for expungement or sealing assuming all other statutory requirements are met. For example, if a petitioner is charged with Shoplifting and Resisting a Merchant that happened at the same time, both charges are eligible for expungement or sealing. What if I have a Prior Expungement or Sealing from another state? If you have previously received a expungement or sealing of your criminal record as a adult in the State of Florida, you are not eligible to petition again. If, however, you received a criminal record expungement or sealing from another state, you may be eligible to petition for another expungement or sealing in the State of Florida. If you have questions about your criminal record and are interested in expunging or sealing a prior criminal offense, contact the Winter Park, Florida criminal defense firm TILDEN LAW, rated A+ by the Better Business Bureau. Winter Park criminal defense Lawyer, Fleet Tilden, has 20 plus years experience successfully achieving criminal record sealing and expungements in criminal cases in Orange County, Seminole County, Lake County, Volusia County, and Osceola County. We represent clients with criminal expungement and sealing cases in all Central Florida courts including: Orange County, Orlando, Seminole County, Altamonte Springs, Osceola County, Kissimmee St. Cloud, Volusia County, Daytona Beach, Deland and Lake County. Contact TILDEN LAW for a free and confidential case evaluation to determine your best defense, 407 599-1234.